"In January of 2002," writes the neuroscientist Oliver Sacks, "I received a letter from Howard Engel, a Canadian novelist describing a strange problem." On July 31, 2001, Engel woke up, dressed, made breakfast, and then went to the front door to get his newspaper. "I wasn't aware," he says in our NPR interview, "that it was any different from any other morning." But it was. When he looked at the front page — it was the Toronto Globe and Mail, an English-language journal — the print on the page was unlike anything he had seen before. It looked vaguely "Serbo-Croatian or Korean," or some language he didn't know. Wondering if this was some kind of joke, he went to his bookshelf, pulled out a book he knew was in English, and it too was in the same gibberish. Engel had suffered a stroke. 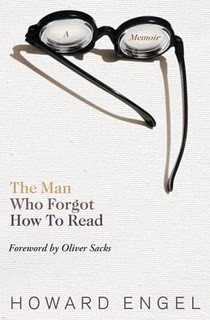 It had damaged the part of his brain we use when we read, so he couldn't make sense of letters or words. He was suffering from what the French neuroscientist Stanislas Dehaene calls "word blindness." His eyes worked. He could see shapes on a page, but they made no sense to him. And because Engel writes detective stories for a living (he authored the Benny Cooperman mystery series, tales of a mild-mannered Toronto private eye), this was an extra-terrible blow. "I thought, well I'm done as a writer. I'm finished." 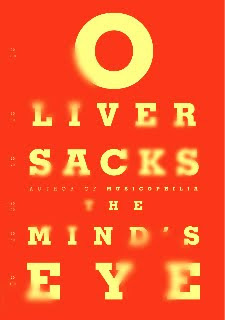 Sacks describes Engel's struggles in a forthcoming book, The Mind's Eye, to be published later this year. The surprise here is that brains are more plastic than one would suppose; even if one part of a brain is compromised by a stroke, a person can sometimes improvise and get another still healthy part of the brain to substitute and help out.